The aromas in the mists bring to life the very distinct spirits and aromas of the places they represent,” says Kate Rosso, Associate of Aveda Pure-Fume™ Aroma. The first one, called Mihana™, is a “lush spicy floral aroma with soft balsamic and bright citrus notes,” says Kate, who under the guidance of Aveda’s Head of Aveda Pure-Fume™ Aroma, Guy Vincent, refers to inspiration boards when creating aromas. The mist contains jasmine, certified organic mandarin, clove, and other pure flower and plant essences. The second mist, Alanara™, a rich, effusive, “oriental” aroma, is reminiscent of the exotic luminous spices, moist rosy florals, and precious incense of the Middle East. Here, Guy was inspired by Dubai, says Kate. “Dubai is an opulent, sparkling city with lots of lights. But it began as a fishing village. He wanted to capture the juxtaposition between modern and traditional,” says Kate, who often smells dozens of incarnations of the aromas Guy creates before they settle on one. She explains that in the Middle East, “fragrancing” oneself is a very elaborate ritual, which includes applying body oil, scenting one’s clothes with incense, and then finally applying aroma—in addition to the pure flower and plant essences mentioned above, this one has certified organic rose, oud, and olibanum. The third and final mist, Marassona™, was inspired by Brazil, says Kate. Guy created a clean, fresh, citrus aroma with a seductive white floral heart. It has certified organic neroli, lemon, ylang ylang, and other pure flower and plant essences, and embodies the dynamic spirit of Brazil, including the city’s famous carnival, says Kate. Whether you fantasize more about being transported to Asia, the Middle East, or Brazil, one thing’s for certain: using our new Pure-Fume™ Hair Mists will ensure that your hair feels as sublime as your aromatic journey. 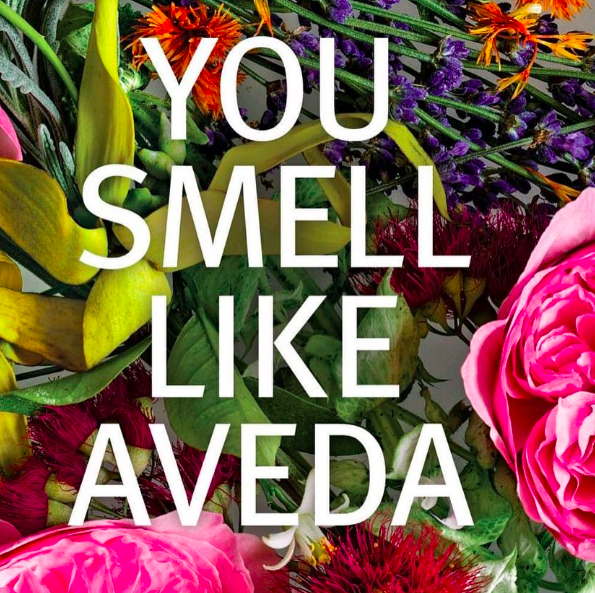 DO YOU LOVE TO SMELL LIKE AVEDA?